As part of their SATs, your Year 6 child will soon be tested in all areas of the key stage 2 maths curriculum. In order to do this, they must sit three separate papers: one arithmetic paper and two mathematical reasoning papers. Schools will of course be making sure that your child is as ready as they can be, but parents often want to be part of this process too. There are lots of helpful and confidence-building ways you can help your child — and hopefully have fun while you do it! One of the biggest challenges you may face as a parent is being aware of what your child is supposed to know by the end of Year 6. It may feel like getting blood out of stone when you ask them what they have been learning about that day, but, before trying to help them at home, you might want to make sure you understand the content of their Year 6 maths curriculum — either by looking online or talking with the class teacher (they may well offer an information session or pack for parents). The best way to help is simply by getting involved with any maths homework. In the lead-up to SATs, I tend to use workbooks which helpfully cover all areas of the curriculum. Whether they’re working through a workbook or on maths homework, sit with your child and ask them to explain the topic to you, show you their working out and double check their answers. (If the school doesn’t use workbooks, you might like to buy some to suit you and your child. This will reveal any areas they are finding particularly tricky; you can then spend your time at home working on those together). Try to work with your child ‘little and often’. Use any opportunity to reinforce the basics, including simple addition and subtraction (shopping is great for this), telling the time or reading timetables, singing your times tables (even when in the car) and finding shapes or angles around you. Times tables underpin so much of mathematical understanding. Any support with these really is crucial if your child is to have that vital instant recall. Make posters, booklets or cards, play games, or sing songs to help your child feel 100% confident. Children also need to be happy with a written method for all four operations: addition, subtraction, multiplication and division. Your child should be aware of the method they have used at school. Find out what this is and make up problems for them which they can work through with you. Get them to show all their working out clearly and neatly as they will need to do this in the paper. Why not try working to a shorter time limit as they become more confident? This will help when they sit the paper under timed conditions. Reading and recognising ‘big’ numbers (up to the millions) — challenge each other to write the numbers in words too. Ordering numbers (including decimals to 3 decimal places) — why not put them on cards and do this physically? Try working out what needs to be added or taken away from a large number to get to the nearest multiple of 10, 100, 1000 and 10,000. Partition (split up numbers) to see what each digit in a number is worth — for example, what would the number become if you were add a 3 to the hundreds? Try as many maths word problems as you can find or create. (For example, Billy catches the bus at 8.15 each morning. His journey to school takes 20 minutes, he then walks for 5 minutes to arrive for registration at 8.50. One morning the bus is 12 minutes late. Will he get to school on time?). Get your child to read the questions to you and underline key information. Ask: What are they being asked to do? Can they explain this to you? Before they even try to answer the questions, ask them to estimate an answer and discuss this together. When they try to answer let your child know that their working out is vital. Simply writing down an answer isn’t enough. Compare their answers to their estimate. Were they close? Then check that they are happy with their answer. Once they have written down their workings and their answers, why not get your child to use a calculator (where possible) to check them? Ask: Were they correct? If not, can they see where they have gone wrong? Go through each step of the problem again until you reach a correct answer. Ask your child to make up a similar problem (but with different values) for you to answer. Let them teach you and then mark your answers. Why not create practical activities, such as cooking, to consolidate maths knowledge? When measuring ingredients, for example, you might discuss what amount would be needed if cooking for more or fewer people, or convert the ingredients from imperial to metric or vice versa. Let them plan a recipe then convert measures and scale up/down quantities. This could also link to complicated timetable work as well as timing. Ask: At what time will the food be ready? What time will it be in 75 minutes? Buy your child a protractor to have at home. They might be very keen to teach you how to use the protractor accurately. Ask them to estimate and then measure angles around the house. Draw a range of shapes: What size are the internal angles? Can they estimate and then measure them? When out and about, ask your child to read timetables for you for times or schedules of events, or ask them to work out how long a journey or an event might last. Any activities that make the maths ‘real’ will be the most powerful and memorable. Maths can still be creative and fun, even when preparing for SATs! Finally, don’t be afraid to see your child’s teacher for guidance or even to see example questions that you can use. We are all working to achieve the best for your child, so communication and collaboration are key! General information on national curriculum tests. Key Stage 2 maths test materials. 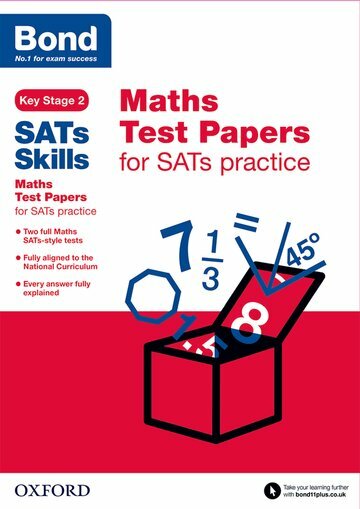 Guide to the KS2 SATs. Preparing for the KS2 reading test.